Campaign group London Health Emergency is urging the NHS to foot the bill for an air ambulance which is at risk of being grounded. The London Air Ambulance service recently appealed for £750,000 to keep the service flying. The service, based in east London, allows medics to reach any incidents within the M25 in less than 15 minutes. But the Department of Health said a decision must be made locally on whether extra money should be given. London Health Emergency spokesman Geoff Martin said: "In a modern, world-class city like London, which is so high on the terrorist target list, it defies belief that our only air ambulance service has to rattle tins on street corners to keep airborne. "The £750,000 that they need this year to keep flying is peanuts compared to what the NHS wastes on management consultants, pay-offs to chief executives and failed computer systems." But the Department of Health (DoH) said while air ambulances do bring benefits in particular circumstances, they are very expensive to operate. A DoH spokesman said: "It can be an effective way of getting better and faster access to hospitals and valuable in supporting inter-hospital transfers. 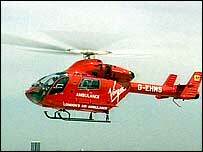 But whilst air ambulances do bring benefits in particular circumstances, they are very expensive to operate. "Therefore, while the NHS does fund the cost of clinical staff on air ambulances, it is a local decision as to whether any additional funding should be made available."